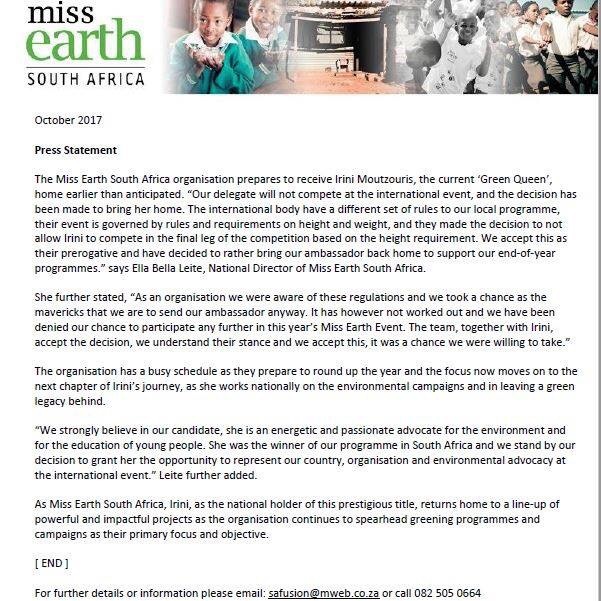 The Miss Earth South Africa organisation prepares to receive Irini Moutzouris, the current ‘Green Queen’, home earlier than anticipated. Earlier today, the MESAO released an official statement taking responsibility to this unfortunate incident. It was their fault for insisting to blindside the Miss Earth Organization in sending Iris to Manila, Philippines, despite their full knowledge of the Rules and Regulations of the international pageant. Now, the questions of the pageant fans about the absence of Iris at the recently concluded Form and Figure Preliminary Competition have been answered.